Background: Instrumentation in patients with osteoporosis is challenging. Bone cement-augmented fenestrated pedicle screw fixation is a new procedure for fixation in the osteoporotic bone; and, applying minimally invasive techniques to the above is a challenging and novel concept. Aims: To evaluate the clinical and radiological outcome of minimally invasive spine surgery transforaminal lumbar interbody fusion (MIS-TLIF) in patients with spondylolisthesis and poor bone quality, performed with rigid instrumentation using bone cement [poly(methylmethacrylate)]-augmented fenestrated pedicle screws. Settings and Design: Prospective, observational, single-center study. Statistical Analysis Used: Wilcoxon nonparametric test for paired samples with a level of significance of 0.05. Methods: A clinical series of 25 patients with lumbar spondylolisthesis and osteoporosis who underwent minimally invasive TLIF with bone cement-augmented pedicle screws were included in the study. Clinical outcome and the function were assessed using the visual analog scale (VAS) score for pain and the Oswestry Disability Index (ODI). Perioperative, postoperative, and long-term complications were monitored with a mean follow-up of 18 months. Results: A total of 25 (20 female and 5 male) patients were included in the study with an average age of 61.05 years. The major symptom was low back pain with radiating pain to lower limbs. The average T-score was −3.0. All the patients were followed clinically and radiologically. There was a statistically significant improvement in the VAS scores and ODI scores postoperatively. No events of cement extravasation, radiological loosening, or pulling out of screws were observed. Conclusions: Fenestrated pedicle screw fixation with bone cement augmentation in patients with osteoporosis is a well-established alternative to increase the pullout strength of screws placed in the osteoporotic bone. Applying the concept of minimally invasive surgery to this procedure makes it a more complete solution for instrumentation in osteoporotic spine. Our series is the largest in literature on spondylolisthesis and confirms the feasibility and safety of this procedure in treating spondylolisthesis in the aging population. Fenestrated pedicle screw fixation with bone cement augmentation in patients with osteoporosis is a well-established alternative to increase the pullout strength of screws placed in the osteoporotic bone. Applying the concept of minimally invasive surgery to this procedure makes it a more complete solution for instrumentation in osteoporotic spine. Our series is the largest in literature on spondylolisthesis and confirms the feasibility and safety of this procedure in treating spondylolisthesis in the aging population. The main issues in this technique are the accuracy and precision of pedicle screw placement and the delivery of bone cement. Our technique of using bone fillers, adapters, and screw extenders for delivering bone cement yielded the best results in literature. Spondylolisthesis is defined as the forward slippage of all or part of one vertebra on another. Surgical treatment of spondylolisthesis typically consists of decompression with or without a fusion procedure and the use of instrumentation would be advantageous for better clinical improvement and higher rates of fusion., Osteoporosis is defined as a bone mass that is 2.5 standard deviations below the bone mass of a normal healthy bone. The technical difficulties and high rates of complications associated with osteoporotic bone fixation are well documented in the literature. Thus, management of patients with spondylolisthesis and osteoporosis is very challenging and though many solutions are proposed, the best modality of treatment is yet to be discovered. Cemented poly (methyl methacrylate) [PMMA] augmentation appears to be the most effective augmentation method as concluded by biomechanical tests. There are only a few studies on the use of bone cement-augmented fenestrated pedicle screws and only one study on minimally invasive technique for spondylolisthesis in literature. Data were collected prospectively from hospital records of patients undergoing minimally invasive transforaminal interbody fusion (MIS-TLIF) and bone cement (PMMA)-augmented transpedicular fenestrated screw fixation for lumbar spondylolisthesis with osteoporosis at our center. Only patients with Grade I and Grade II spondylolisthesis who failed conservative trial and who had associated osteoporosis (bone mineral density [BMD] T-score <−2.5) were included in the study. Symptomatic cases of lumbar spondylolisthesis with normal BMD scores, patients unwilling to undergo surgery, patients unfit for surgery, and patients with spondylolisthesis of Grade III and above, were excluded from the study. All the patients were evaluated clinically preoperatively, postoperatively and during follow-up; the findings of history, clinical examination, visual analog scale (VAS) score, and Oswestry Disability Index (ODI) were tabulated. All the patients were subjected to radiological investigations which included X-rays (SIEMENS, 500 mA, India 2009) lateral views (flexion, extension), and anteroposterior views. Types, level, and grade of listhesis were evaluated. Magnetic resonance imaging (SIEMENS, 1.5 TESLA, Germany 2002) was used to evaluate the associated pathology. Computed tomography (SIEMENS, 128 slice, Germany 2009) was done preoperatively and 6 months post-operatively. Bone mineral densitometry (dual energy X-ray absorptiometry [DEXA] scan, Holland 2006) was done to assess T and Z scores and the findings were tabulated. Data collection and analysis were performed using the Statistical Package for the Social Sciences (SPSS) version 15.0 for Windows (SPSS, Inc., Chicago, IL). Pre- and post-operative VAS scale scores and ODI scores were compared using the Wilcoxon nonparametric test for paired samples with a level of significance of 0.05. After a proper informed consent, the patients were taken up for surgery. Under general anesthesia, in a prone position, under the exact fluoroscopic anteroposterior view of the vertebral body, the projections of the target pedicles were identified and drawn on the skin [Figure 1]a. A Jamshidi needle [Figure 1]b and [Figure 2]a was placed into the pedicle through a stab incision placed approximately 10–20 mm lateral to the pedicle's upper quadrant projection under fluoroscopic guidance. K-wire guide was then placed through the Jamshidi needle and advanced to approximately two-thirds of the vertebral body depth [Figure 2]b. K-wire guides were placed in all the target pedicles [Figure 1]c and [Figure 2]c. Dilators of progressively larger sizes were passed on the guide wires to create the working channel by dilating the muscle tissue. The pedicles were prepared by tapping with a tap undersized to the screw. Polyaxial cannulated and fenestrated screws (Medtronic, Sofamor, Danek, USA) [Figure 3] of appropriate size, and lengths were inserted into the pedicle over the K-wire guide [Figure 2]d. Each fenestrated screw was attached to an adaptor [Figure 1]d through which bone cement was injected [Figure 2]e. Bone cement [PMMA] (Osteopal, Heraeus Kukzer GmbH, Hanau, Germany) with a setting time of 8–10 min was mixed according to the manufacturer's recommendations and when the viscosity was like toothpaste, it was injected through bone cement filler into the fenestrated screw [Figure 4]a. A total of six bone fillers were used per case. An average of 2–4 ml cement was injected into the vertebral body under continuous fluoroscopic monitoring. The placement of screws was done unilaterally first on the asymptomatic side, and then the screws were placed on the symptomatic side after performing transforaminal interbody fusion through METRx (Medtronic, Memphis, TN, USA) tubular retractor [Figure 4]b. A single large interbody polyether ether ketone (PEEK) cage (Capstone, Medtronic) was inserted into the disc space [Figure 4]c. SEXTANT (Medtronic) system was used to insert the rods percutaneously [Figure 4]d.
Of the 25 patients operated, the age at presentation ranged from 54 to 65 years with the average age of presentation being 61.05 years. Twenty patients (80%) were females, and five (20%) were males. The female-to-male ratio was 4:1. The duration of symptoms varied from 6 months to 6 years with the average duration of symptoms being 3.5 years. Pain was the most common complaint before surgery. Pain assessment was done by means of the VAS score. The preoperative VAS ranged from 6 to 8 with the average preoperative score being 7.33. The quality of life was assessed by means of the ODI score. The preoperative ODI score ranged from 32 to 47 with the average preoperative score being 41.66. Patients with spondylolisthesis were graded according to Myerding grading. In a total of 25 patients, 10 (40%) patients fell in Grade I group and 15 (60%) patients fell in Grade II group. According to the protocol, all patients underwent a preoperative BMD examination and the T-score ranged from −3.3 to −2.5 with a mean value of −3.0. There was no event of extravasation of bone cement intraoperatively. There were no incidents of pedicle breach, or of dural, cord, or nerve root injuries intraoperatively. Postoperatively, the patients did not develop any new deficits. None of the patients had a postoperative wound infection. All the patients were followed up regularly. The follow-up ranged from 6 to 25 months with the average follow-up being 18 months. During the follow-up visits, all the patients were assessed clinically and radiologically. The postoperative VAS score ranged from 2 to 4 with the average postoperative score being 2.66. There was a significant decrease in the VAS score (P< 0.001). Postoperative ODI score ranged from 15 to 21 with the average postoperative score being 18.16. Statistically significant improvement in the quality of life was noted (P< 0.001). There were no instances of screw pullout or hardware failure. There was a reduction of the grade of listhesis in all the patients. The alignment of the screws and distribution of cement around the screws were adequate [Figure 5]. There were no new neurological deficits or wound-related complications. All the patients achieved fusion, evidenced by the flexion-extension lateral radiographs of the lumbar spine taken during the follow-up visit. No evidence of lucency developing around the screw heads and bone cement mass was observed on the follow-up computed tomograms. The World Health Organization defines osteoporosis as bone density 2.5 standard deviations below the mean density for healthy young people. With the increasing life expectancy of the population, the population at risk of developing osteoporosis has increased. The estimated rate of incidence of osteoporosis in patients above 50 years of age undergoing spine surgery is 51.3% for female and 14.5% for male patients. Osteoporosis is considered as a significant independent predictor of hardware-related complications in spine surgery. The technical difficulties and the high rates of complications associated with osteoporotic bone fixation like pedicle fractures, pseudarthrosis, adjacent level degeneration, compression fractures, subsidence, and junctional kyphosis are well documented in the literature., With advancements and improvements in the techniques for spinal instrumentation, surgical management is being considered more frequently in older patients with osteoporosis. Instrumentation with the posterior pedicle screw system is an accepted technique to achieve rigid internal fixation in various spinal disorders. The bone-implant interface is the main determinant of stability of the posterior pedicle screw system, and this is considered the weak link in osteoporosis. The goal of spinal instrumentation in osteoporosis is to strengthen this bone-implant interface. 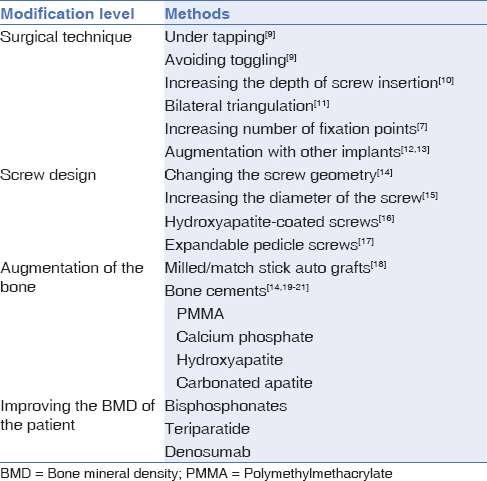 The bone-implant interface can be strengthened by modifications at different levels [Table 1] namely, (a) the surgical technique of screw insertion, (b) the design of the screw, (c) the augmentation of the bone, and (d) improvement of the BMD of the patient. Modifications in the surgical technique include under tapping and avoiding toggling, increasing the depth of screw insertion, bilateral triangulation, increasing the number of fixation points, and augmentation with other implants., Tapping pilot holes into the osteoporotic bone decreases the insertional torque and pullout strength of screws; thus, under tapping or no tapping prior to pedicle screw insertion has been advocated. Biomechanical studies have shown a significant increase (430%) in the number of cycles to failure when comparing screws inserted to 50% of the depth of the vertebral body as compared to those inserted through the opposite cortex. Choosing a screw trajectory to engage the hard subchondral bone rather than the cancellous bone of the body, and medialization of the screw vector with triangulation of bilateral screws can enhance fixation in the osteoporotic spine. Adding additional levels in the construct distributes the forces by increasing the fixation points and reduces the burden at each bone-implant interface in the osteoporotic spine. Augmenting the pedicle screw construct with other implants like hooks  and Nesplon tape  in the sublaminar space connected to a rod significantly increases the strength of the constructs compared to pedicle screw constructs alone. This may be due to the higher regional bone density concentration in the lamina as compared to the pedicle. Modifications in the implant include changes in the screw geometry, increasing the diameter of the screw, using hydroxyapatite-coated screws, and using expandable pedicle screws. Components of screw geometry that strengthen the bone-screw interface purchase are increased thread diameter, increased thread depth, and increased length of engagement. The mean axial pullout force was increased from 459 ± 183 N to 994 ± 349 N just by increasing the diameter by 1 mm. A clinical study of hydroxyapatite-coated pedicle screws showed a statistically significant increase in the calculated mean extraction torque as compared to the noncoated screws. There were more radiolucent zones surrounding the uncoated screws than the hydroxyl apatite-coated screws. Biomechanical comparison of expandable pedicle screws when applied in osteoporotic cadavers suggested that they tend to increase the pullout strength of the bone-screw interface by 50% as compared to a conventional self-tapping screws. The problem with expandable pedicle screws, however, is that during a revision surgery, they tend to destroy the pedicle if removal is attempted. Augmentation of the osteoporotic bone with either autografts  or various types of bone cement ,,, is another method of strengthening the bone-implant interface. 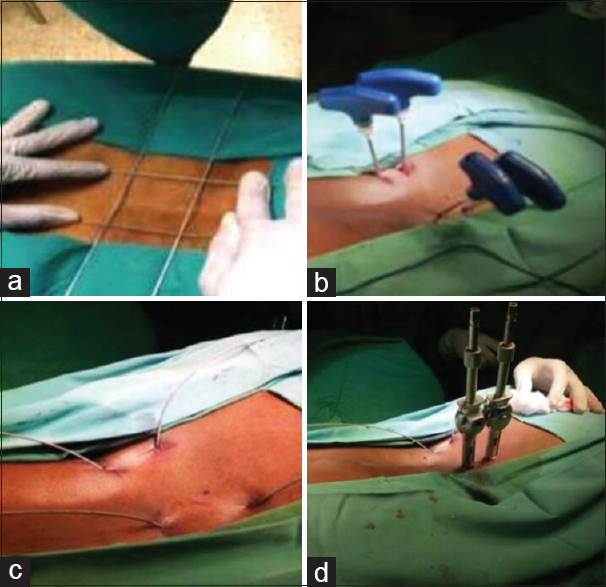 Milled and matchstick bone autografts increase the screw pullout strength by 50–70%, but this technique is not feasible for minimally invasive surgery. The bone-screw interface may also be improved by injecting bone cement into the pedicle around the pedicle screw. The commonly used bone cement is PMMA. Other cements such as hydroxyapatite cement, calcium phosphate, and carbonated apatite may also be used.,,, The disadvantage of using non-PMMA cement is that it often requires 4–24 h to reach maximal stiffness for screw fixation augmentation, whereas PMMA achieves immediate stiffness. Studies comparing PMMA-augmented and nonaugmented screws in osteoporotic cadaveric vertebrae found a 2-fold increase in axial pullout strength , and noted restoration of baseline axial pullout strength following PMMA screw augmentation even in previously instrumented cadaveric vertebrae. Two different techniques for cement augmentation are described: (a) In the first method, cement is injected into the vertebral body after which a solid screw is inserted; (b) in the second method, fenestrated or cannulated pedicle screw is placed, and the cement is injected through the fenestrations in the screw into the vertebral body. 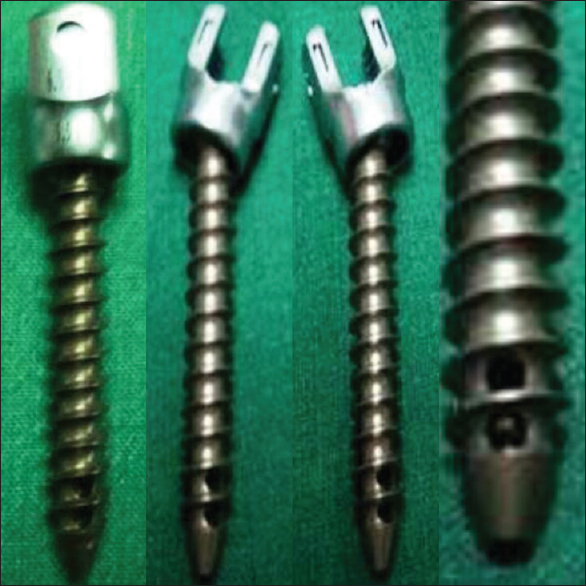 The biomechanical properties of screws inserted after injecting cement, and of fenestrated screws through which cement is injected in cadaveric, osteoporotic spine were compared. The strength of fixation in terms of pullout strength was better in screws placed in the preinjected cement; but when cement was injected through the fenestrated screws, it was safer as the technique confined the cement placement to within the vertebral body and prevented cement extrusion into the spinal canal. Cadaveric studies determining the biomechanical properties of PMMA-augmented fenestrated screws with increasing numbers of radial holes, found that axial pullout strength increased directly with an increasing number of radial screw holes. Using the conventional method, distribution of bone cement is not controlled during the injection leading to leakage of bone cement into the spinal canal, neural foramen, and vertebral venous plexus. Leakage of bone cement and the exothermic reaction that occurs as the cement hardens can lead to catastrophic events like paraplegia, pulmonary embolism, and even death. The development of cannulated, fenestrated screws increased the ease and safety of cement delivery. Fenestrated cannulated pedicle screws allowed for a controlled and even distribution of the bone cement around the fenestrations in the vertebral body thus minimizing the complications. Chang et al., evaluated the clinical results of patients with osteoporosis treated surgically with PMMA-augmented cannulated pedicle screws, and compared this method with the needle injection technique. The clinical outcomes of both techniques were satisfactory, and there were no significant differences. Although the pullout strength was significantly higher in the needle injection group, the operation time was shorter, and the cement leakage rate was less in the cannulated pedicle screw group. Amendola et al., evaluated 21 patients with a poor bone stock condition due to osteoporosis or tumor who underwent posterior stabilization by fenestrated pedicle screws and PMMA augmentation. There was a statistically significant reduction in pain and improvement in the quality of life. No radiological loosening or pulling out of screws was observed. In two cases, cement leakage occurred intraoperatively. One patient who suffered from transitory nerve root palsy improved spontaneously, while the surgeon immediately removed the excessive cement before its setting in the other case. Piñera et al., investigated the clinical and radiological outcome of 23 patients with degenerative lumbar instability and osteoporosis treated with fusion using PMMA-augmented fenestrated pedicle screws. Pain and function improved at 6 months and were maintained at the final follow-up. No clinical complications secondary to PMMA leakage developed. Xie et al., reviewed 31 patients with degenerative lumbar scoliosis and compared 14 of them treated with bone cement (PMMA)-augmented pedicle screw and 17 patients with autogenous bone. They concluded that a lesser need for oral analgesics was the potential benefit of PMMA augmentation, at the cost of more medical expenditure. Dai et al., reviewed the clinical details of 43 patients with degenerative spinal disease and osteoporosis who underwent lumbar fusion using PMMA-augmented pedicle screws. The VAS and ODI scores showed a statistically significant improvement. Intraoperative cement leakage occurred in four patients, but no neurological complications were observed. Radiological observation indicated no loosening or pulling out of the novel screws, and the bone fusion was excellent. All the above-mentioned studies,,,,, utilizing PMMA-augmented fenestrated pedicle screws in the open techniques, concluded that fenestrated screws for cement augmentation is a safe and efficient procedure, and provided effective long-lasting vertebral purchase in patients with osteoporosis. Open fusion procedures are effective for spondylolisthesis, but disrupt the native anatomy leading to extensive muscle injury, muscular atrophy, and failed back syndrome. After the first description of microendoscopic discectomy by Foley and Smith, using muscle splitting serial tube dilators and retractors to minimize disruption of the paraspinal musculature, the field of minimally invasive spine surgery is evolving rapidly with expanding indications like the minimally invasive transforaminal lumbar interbody fusion (MIS-TLIF). Lubansu et al., performed a percutaneous cement augmentation in 15 elderly osteoporotic patients (with performance of MIS-TLIF in 7 patients). They used a cement delivery system (V-MAX, DePuy Spine) in combination with a specifically designed connector for percutaneous cement injection through the screw extenders. The authors evaluated cement extravasations and observed 5 instances of cement extravasations in 78 screws (6.4%) in 5 patients (33.3%); however, none of them could be classified as 'symptomatic'. The authors found no episode of screw loosening after a mean follow-up of 36 months. Pesenti et al., performed percutaneous cement augmentation in 12 patients with thoracolumbar fractures due to various etiologies. They used fenestrated screws which were partially cannulated only in the first one-third length of the screw. With a short follow-up period of 3 months, they noticed satisfactory clinical and radiological outcome; however, there was one instance of cement-related pulmonary embolism. Klingler et al., performed percutaneous cement augmentation in a heterogeneous group (having a degenerative, traumatic, or tumor related pathology) of 35 patients (MIS-TLIF procedure was performed in 24 patients in this cohort)) and 157 screws spanning the thoracic and lumbar spine. They used fenestrated screws (CD Horizon fenestrated screw system, Medtronic) with metallic bone cement injection cannulas (Tsunami medical, San Possidonio, Italy). The injection cannulas were filled with bone cement and were inserted into the screw heads; and, the cement was delivered with a pusher under fluoroscopic guidance. After a mean follow-up of 12.8 months, they encountered one screw loosening (0.6%), cement extravasations in 27 screws (17.2%), and a fresh neurological deficit in one patient. We performed the percutaneous cement-augmented MIS-TLIF procedure in a group of 25 patients with osteoporosis using fenestrated screws (CD Horizon fenestrated screw system, Medtronic). All our patients had spondylolisthesis. The cement augmentation was done using bone fillers placed in the adapters, which in turn were attached to the screw heads through the extenders; this system is more effective in preventing cement extravasation. This fact was evident by the zero screw extravasation rate in our series. After a mean follow-up of 18 months, there were no incidences of screw pullout or hardware failure. Our study is the first study in the literature which is completely dedicated to the management of spondylolisthesis and osteoporosis. We injected the bone cement percutaneously through bone fillers, adapters, and screw extenders making the equipment a foolproof system with zero extravasation rates. Fenestrated pedicle screw fixation with bone cement augmentation in patients with osteoporosis is a well-established alternative to increase the pullout strength of screws placed in the osteoporotic bone. Applying the concept of minimally invasive surgery to this procedure makes it a more complete solution for instrumentation in the osteoporotic spine. Our series confirms the feasibility and safety of this procedure in treating spondylolisthesis in the aging population. The main issues in this technique are the accuracy and precision of pedicle screw placement, and an effective delivery of bone cement. Our technique of using bone fillers, adapters, and screw extenders for delivering bone cement yielded the best results in literature. Osteoporosis: Review of the evidence for prevention, diagnosis and treatment and cost-effectiveness analysis. Introduction. Osteoporos Int 1998;8 Suppl 4:S7-80. Chin DK, Park JY, Yoon YS, Kuh SU, Jin BH, Kim KS, et al. Prevalence of osteoporosis in patients requiring spine surgery: Incidence and significance of osteoporosis in spine disease. Osteoporos Int 2007;18:1219-24. Esses SI, Sachs BL, Dreyzin V. Complications associated with the technique of pedicle screw fixation. A selected survey of ABS members. Spine (Phila Pa 1976) 1993;18:2231-8. Dipaola CP, Bible JE, Biswas D, Dipaola M, Grauer JN, Rechtine GR. Survey of spine surgeons on attitudes regarding osteoporosis and osteomalacia screening and treatment for fractures, fusion surgery, and pseudoarthrosis. Spine J 2009;9:537-44. Halvorson TL, Kelley LA, Thomas KA, Whitecloud TS 3rd, Cook SD. Effects of bone mineral density on pedicle screw fixation. Spine (Phila Pa 1976) 1994;19:2415-20. Liu D, Wu ZX, Pan XM, Fu SC, Gao MX, Shi L, Lei W. Biomechanical comparison of different techniques in primary spinal surgery in osteoporotic cadaveric lumbar vertebrae: Expansive pedicle screw versus polymethylmethacrylate-augmented pedicle screw. Arch Orthop Trauma Surg 2011;131:1227-32. DeWald CJ, Stanley T. Instrumentation-related complications of multilevel fusions for adult spinal deformity in patients over age 65: Surgical considerations and treatment options in patients with poor bone quality. Spine (Phila Pa 1976) 2006;31(19 Suppl):S144-51. Röllinghoff M, Zarghooni K, Groos D, Siewe J, Eysel P, Sobottke R. Multilevel spinal fusion in the aged: Not a panacea. Acta Orthop Belg 2011;77:97-102. Pfeiffer FM, Abernathie DL, Smith DE. A comparison of pullout strength for pedicle screws of different designs: A study using tapped and untapped pilot holes. Spine (Phila Pa 1976) 2006;31:E867-70. Zindrick MR, Wiltse LL, Widell EH, Thomas JC, Holland WR, Field BT, et al. 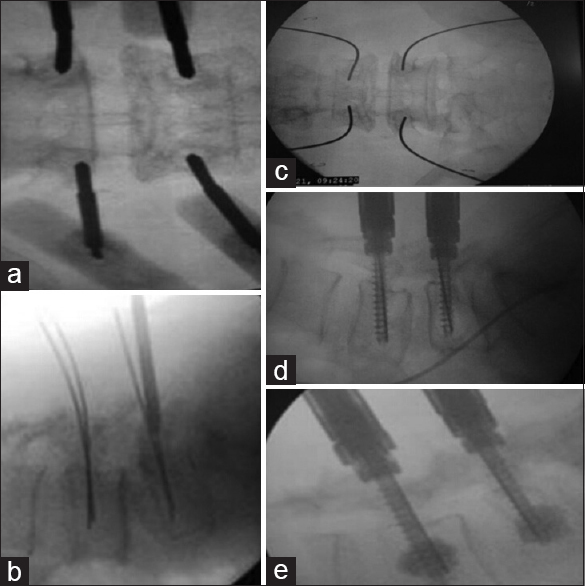 Abiomechanical study of intrapeduncular screw fixation in the lumbosacral spine. Clin Orthop Relat Res 1986;203:99-112. Ruland CM, McAfee PC, Warden KE, Cunningham BW. Triangulation of pedicular instrumentation. A biomechanical analysis. Spine (Phila Pa 1976) 1991;16 6 Suppl:S270-6. Hamasaki T, Tanaka N, Kim J, Okada M, Ochi M, Hutton WC. Pedicle screw augmentation with polyethylene tape: A biomechanical study in the osteoporotic thoracolumbar spine. J Spinal Disord Tech 2010;23:127-32. Hasegawa K, Takahashi HE, Uchiyama S, Hirano T, Hara T, Washio T, et al. An experimental study of a combination method using a pedicle screw and laminar hook for the osteoporotic spine. Spine (Phila Pa 1976) 1997;22:958-62. Lotz JC, Hu SS, Chiu DF, Yu M, Colliou O, Poser RD. 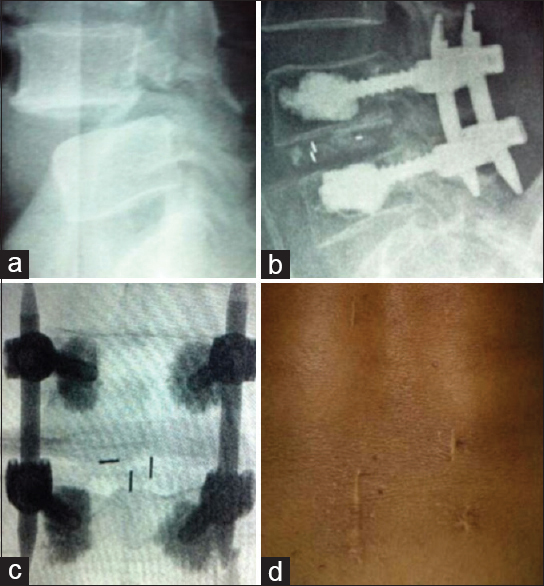 Carbonated apatite cement augmentation of pedicle screw fixation in the lumbar spine. Spine (Phila Pa 1976) 1997;22:2716-23. Wittenberg RH, Lee KS, Shea M, White AA 3rd, Hayes WC. Effect of screw diameter, insertion technique, and bone cement augmentation of pedicular screw fixation strength. Clin Orthop Relat Res 1993;296:278-87. Sandén B, Olerud C, Petrén-Mallmin M, Larsson S. Hydroxyapatite coating improves fixation of pedicle screws. A clinical study. J Bone Joint Surg Br 2002;84:387-91. Cook SD, Salkeld SL, Whitecloud TS 3rd, Barbera J. Biomechanical evaluation and preliminary clinical experience with an expansive pedicle screw design. J Spinal Disord 2000;13:230-6. Pfeifer BA, Krag MH, Johnson C. Repair of failed transpedicle screw fixation. A biomechanical study comparing polymethylmethacrylate, milled bone, and matchstick bone reconstruction. Spine (Phila Pa 1976) 1994;19:350-3. Yerby SA, Toh E, McLain RF. Revision of failed pedicle screws using hydroxyapatite cement. A biomechanical analysis. Spine (Phila Pa 1976) 1998;23:1657-61. Moore DC, Maitra RS, Farjo LA, Graziano GP, Goldstein SA. Restoration of pedicle screw fixation with an in situ setting calcium phosphate cement. Spine (Phila Pa 1976) 1997;22:1696-705. Becker S, Chavanne A, Spitaler R, Kropik K, Aigner N, Ogon M, et al. Assessment of different screw augmentation techniques and screw designs in osteoporotic spines. Eur Spine J 2008;17:1462-9. Cook SD, Salkeld SL, Stanley T, Faciane A, Miller SD. Biomechanical study of pedicle screw fixation in severely osteoporotic bone. Spine J 2004;4:402-8. Sarzier JS, Evans AJ, Cahill DW. Increased pedicle screw pullout strength with vertebroplasty augmentation in osteoporotic spines. J Neurosurg 2002;96 3 Suppl:309-12. Choma TJ, Pfeiffer FM, Swope RW, Hirner JP. Pedicle screw design and cement augmentation in osteoporotic vertebrae: Effects of fenestrations and cement viscosity on fixation and extraction. Spine (Phila Pa 1976) 2012;37:E1628-32. Chen LH, Tai CL, Lai PL, Lee DM, Tsai TT, Fu TS, et al. Pullout strength for cannulated pedicle screws with bone cement augmentation in severely osteoporotic bone: Influences of radial hole and pilot hole tapping. Clin Biomech (Bristol, Avon) 2009;24:613-8. Lee BJ, Lee SR, Yoo TY. Paraplegia as a complication of percutaneous vertebroplasty with polymethylmethacrylate: A case report. Spine (Phila Pa 1976) 2002;27:E419-22. Jang JS, Lee SH, Jung SK. Pulmonary embolism of polymethylmethacrylate after percutaneous vertebroplasty: A report of three cases. Spine (Phila Pa 1976) 2002;27:E416-8. Childers JC Jr. Cardiovascular collapse and death during vertebroplasty. Radiology 2003;228:902. Hu MH, Wu HT, Chang MC, Yu WK, Wang ST, Liu CL. Polymethylmethacrylate augmentation of the pedicle screw: The cement distribution in the vertebral body. Eur Spine J 2011;20:1281-8. Chang MC, Kao HC, Ying SH, Liu CL. Polymethylmethacrylate augmentation of cannulated pedicle screws for fixation in osteoporotic spines and comparison of its clinical results and biomechanical characteristics with the needle injection method. J Spinal Disord Tech 2013;26:305-15. Amendola L, Gasbarrini A, Fosco M, Simoes CE, Terzi S, De Iure F, et al. Fenestrated pedicle screws for cement-augmented purchase in patients with bone softening: A review of 21 cases. J Orthop Traumatol 2011;12:193-9. Piñera AR, Duran C, Lopez B, Saez I, Correia E, Alvarez L. Instrumented lumbar arthrodesis in elderly patients: Prospective study using cannulated cemented pedicle screw instrumentation. Eur Spine J 2011;20 Suppl 3:408-14. Xie Y, Fu Q, Chen ZQ, Shi ZC, Zhu XD, Wang CF, et al. Comparison between two pedicle screw augmentation instrumentations in adult degenerative scoliosis with osteoporosis. BMC Musculoskelet Disord 2011;12:286. Dai F, Liu Y, Zhang F, Sun D, Luo F, Zhang Z, et al. Surgical treatment of the osteoporotic spine with bone cement-injectable cannulated pedicle screw fixation: Technical description and preliminary application in 43 patients. Clinics (Sao Paulo) 2015;70:114-9. Lubansu A, Rynkowski M, Abeloos L, Appelboom G, Dewitte O. Minimally invasive spinal arthrodesis in osteoporotic population using a cannulated and fenestrated augmented screw: Technical description and clinical experience. Minim Invasive Surg 2012;2012:507826. Pesenti S, Blondel B, Peltier E, Adetchessi T, Dufour H, Fuentes S. Percutaneous cement-augmented screws fixation in the fractures of the aging spine: Is it the solution? Biomed Res Int 2014;2014:610-75. Klingler JH, Scholz C, Kogias E, Sircar R, Krüger MT, Volz F, et al. Minimally invasive technique for PMMA augmentation of fenestrated screws. Scientific World Journal 2015;2015:979186. Motosuneya T, Asazuma T, Tsuji T, Watanabe H, Nakayama Y, Nemoto K. Postoperative change of the cross-sectional area of back musculature after 5 surgical procedures as assessed by magnetic resonance imaging. J Spinal Disord Tech 2006;19:318-22. Sihvonen T, Herno A, Paljärvi L, Airaksinen O, Partanen J, Tapaninaho A. Local denervation atrophy of paraspinal muscles in postoperative failed back syndrome. Spine (Phila Pa 1976) 1993;18:575-81. Isaacs RE, Podichetty VK, Santiago P, Sandhu FA, Spears J, Kelly K, et al. 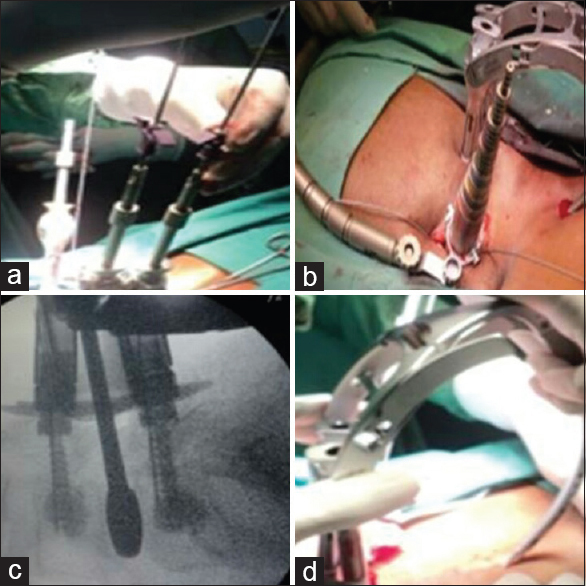 Minimally invasive microendoscopy-assisted transforaminal lumbar interbody fusion with instrumentation. J Neurosurg Spine 2005;3:98-105. Kim KT, Lee SH, Suk KS, Bae SC. The quantitative analysis of tissue injury markers after mini-open lumbar fusion. Spine (Phila Pa 1976) 2006;31:712-6. Wang J, Zhou Y, Zhang ZF, Li CQ, Zheng WJ, Liu J. Comparison of one-level minimally invasive and open transforaminal lumbar interbody fusion in degenerative and isthmic spondylolisthesis grades 1 and 2. Eur Spine J 2010;19:1780-4.